WHY GOD MADE MOMS: Great answers by 2nd graders to the following questions. 4. Moms have magic; they make you feel better without medicine. 1. My mom says she don’t do spare time. 2. Nothing. She pays bills all day long. 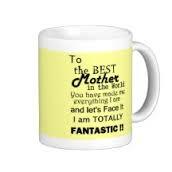 Well, 2nd Cup friend, if your mother is alive, give some thought to loving on her around Mother’s Day. Every mom I know privately knows she could’ve done better if she knew back when what she now knows. Well, duh. All of us can say that. Truth is, our mothers – every one of them – carried emotional, psychological, spiritual and physical burdens none of us ever knew. It’s likely we never will this side of Heaven. None of those things are offered as excuse for wrong living or treatment. They were what they were. Yet God offers grace to us all when a grand total of none have it coming. It’s probably okay to leave all youthful, egoistic criticisms in God’s hands and just offer love to your mom. I’ll bet she’ll understand. Besides, there’s this little matter of you . . .